1. Bunnies are a lot of work. They poop a lot. They need groomed. You have to be careful what you feed them. They need exercise. While they can be potty trained, the litter needs to be changed constantly. 2. A pet bunny should really be indoors. It is easy to think that if you get one, you could have it in a hutch outdoors. However, you are exposing a small creature to the elements as well as possible predators. 3. Pet bunnies are not good pets for small children. You have to handle them properly or they could be easily injured. Also, they are skittish and can die of a heart attack from fright because children move too fast and scare them. 4. A pet bunny could live for a long time. If you get one as a pet, be prepared that it could live more than 8 years. 1. Many rabbits don’t like to be held. Some are cuddly, many are not. If you are looking for a pet to snuggle, a rabbit may not be right for you. 2. Plan on getting a big enough cage that your bunny has plenty of room to move freely. Rabbits need lots of exercise and will need time out of the pen as well. 3. You will need to bunny proof your home. Bunnies are curious creatures. They also like to chew things. 4. Bunny teeth continue to grow throughout their lives. It’s important to have proper chew toys. 5. Bunnies are intelligent and love attention. If you cannot provide daily stimulation for it, a bunny is probably not for you. 6. It is important to get your bunny spayed/neutered. It can help against behavioral problems, spraying, and helps protect female rabbits from uterine cancer. 7. Bunnies like to be clean, so you will need to keep the pen clean. Also, they can be potty trained. It is pretty easy too. You just look for the corner that the bunny goes potty most and put the litter box there. My advice is that if you have small children, a bunny is not the best choice for a pet. Also, as an Easter gift, a chocolate or stuffed bunny would be a better choice. If you are looking to have a pet bunny and are willing to make the commitment, I recommend seeking a reputable breeder over a pet store bunny. 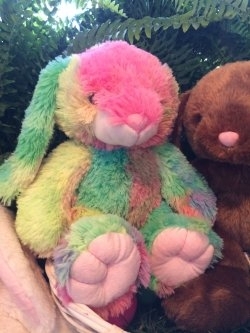 A great alternative to a real bunny! I have raised rabbits most of my life. I lived on a farm and had show rabbits as well as market rabbits for 4-H. Once I got married, I got a pet rabbit named Molly, who was my spoiled rotten fur baby until the day she died. She was very intelligent and had ways of letting me know when she was hungry or wanted to play. She also liked to watch me play video games. She was protective over me and my daughter (whom I think she thought she was the mama), and she did not like it if I had to go away for a few days. So I am not writing all of this to tell you that you shouldn’t have a rabbit as a pet. I am just writing this because I want you to know what it takes to have one. To all of you who celebrate Easter, I wish you a very happy holiday! I had a bunny when I was little and we did walk it on a leash never went to the bathroom other than in the pen and thought she was a pretty good pet. But my mom was a stay at home mom and made sure she was taken care of during the day. Ours did have a heart attack while outside in her “extra” pen while we cleaned her cage a dog came up and tried to attack her great post and yes they are a lot of work! Great advice! When I was a kid we lived in the country and had chickens. A friend of my Mom’s had baby bunnies so she got one for each of us 4 kids (not for Easter). They did live outside most of the time, but we had their pens in the fenced in area with the chickens. At some point, we decided to move the pen closer to the house, and that very night their pens were torn apart and our sweet bunnies were killed. If I ever get a bunny again it definitely won’t be living outside! I also don’t think it’s a good idea to purchase a pet for any kind of holiday, it really needs to be an informed decision no matter what kind of pet it is. When I was younger and lived on a farm, we had a rabbit barn because I had show rabbits and breeding rabbits. We only had one instance where one of ours got hurt, and it was because the neighbor dog from down the road broke the screen door down and gave one of my bunnies a heart attack. It was definitely heartbreaking though. This is awesome information! I did not realize this♥! Thank you so much for sharing. Wow, good information! My neighbors who are single own one. It is big AND FAT but they almost eat like them. Everything is bitten around their home and it just smells. I would not even want to own one lest take care of one.